''I got involved in Made in Hackney after a long period of not working. I was looking for a way to get back into doing something meaningful in the community and helping people. I had spent the last three years recovering from a form of post traumatic stress syndrome and had been unable to work. I had not even been able to walk properly. This set back happened just as I had graduated with a first class honours degree in human nutrition, and it completely wiped out any plans to go on to further studies or pursuing any work in this field. I was starting to get my energy back and was looking for a way to reach people from vulnerable and low income backgrounds to share my passion for healthy eating. I’ve been a vegan for over 25 years and had previously worked for a vegan catering project where I prepared meals for functions to raise money for animal charities. I was keen to once again do something related to health and nutrition. What I’ve most enjoyed about volunteering with Made in Hackney is helping people. To be able to put a smile on people’s faces. Learning one new healthy recipe makes a tiny difference in someone’s life, but can make a big difference overall. I’ve worked with the charity East London Vision, a group of partially sighted (some completely blind) people helping them learn how to cook affordable and delicious recipes, which makes me feel like it’s all been worth it. I’ve also assisted on a Cooking for Life course with a group of men at the Single Homeless Project in Camden. These guys loved what we were doing, despite at first not believing we were cooking without meat! Seeing the sense of gratitude from participants after each class makes you feel so positive. It contributes to a ripple effect. 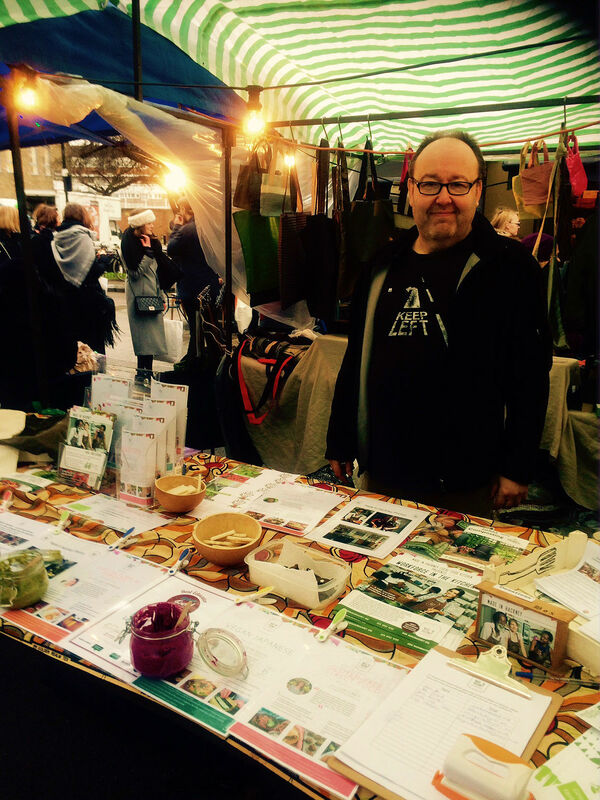 In the photo you see me helping at a stall at Broadway market last December, when we braved the wind and rain to talk to passers by and entice them to get involved with the Made in Hackney experience. This is another of the many rewarding ways you can get involved as a volunteer. The induction I received when I joined helped pepare me for volunteering. I have also had the opportunity to attend a one day Introduction to Nutrition course, led by Jayne Totty, one of MIH ‘s very knowlegable teachers. My studies came pouring back which had been buried away in a garage somewhere! The course gave me the motivation to get back into the books, refreshing what I know. I’ve since also signed up for a Emergency First Aid course. It’s just the buzz I need. Andi has been a class host with Made in Hackney since September 2015. If you'd like to find out how you can become a volunteer please visit our volunteer page.